The final decree or decree of divorce represents the official, sanctioned outcome of a divorce action. Signed by the presiding judge, the decree lists the parties involved, as well as the decisions taken in the case over child custody, the division of assets, and other matters. If you are a party to the divorce, it is vital that you keep a copy of the decree in a safe place; various public agencies and private firms will require it to verify your marital status. Although the court should provide you with a certified copy of the decree, you can easily obtain another copy if you need one. If you were not a party to the divorce, most courts require additional paperwork before releasing a copy of the decree. The civil court where you filed your divorce keeps a copy of the divorce decree in its records, both electronic and hardcopy. By state law, the court is required to keep the decree on file for a minimum period of time, typically seven or 10 years. Your first step is to visit the clerk’s office of this court, once you have verified the location of the decree with an online search. You will need identification as well as the case number; if you don't have the case number, the clerk may be able to search by party, date, attorney(s), or judge. 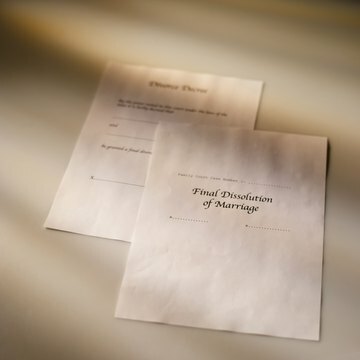 If you were not a party to the divorce, the court may require a notarized letter or signed affidavit from one of the parties, granting you permission to view or copy the document. If the court clerk no longer has the divorce records in custody, apply to the department of vital records, office of vital statistics, or registrar, in the county where your divorce case took place. If the county records department does not keep divorce decrees, contact your state department of records or registrar. You can find the contact information online. If you were not a party to the divorce, you will find that the records are not available unless you can provide signed and notarized permission from one of the parties in the form of a letter, notice or affidavit. If you are still unable to track down a copy of the decree, and you had an attorney represent you in the case, contact this attorney for a copy of the divorce decree and any other records pertaining to the case. Attorneys keep closed files on hand for several years, as mandated by state law and regulations. If your own attorney does not have the file, you may apply to your ex-spouse's attorney; with the written permission of your ex-spouse you will be able to get a copy of the decree from this file. As a last resort, you may be able to track down a copy of a divorce decree online. Various Internet sites offer search engines and databases that may help you locate the decree if by chance it is not on file in the county or state where it should be. These sites customarily charge a fee for a viewable and printable copy of the document. Also, many jurisdictions limit access to public records and may prohibit you from viewing the decree, unless you are a party to the case, or an attorney representing one of the parties. Notwithstanding the age of computerized records, finding divorce records can be a difficult and time consuming task. Not only are divorce records spread among the 50 states, and each county for that state, but many county courts do not have their divorce records online or electronically available to the public. In these cases, the person searching for a divorce record has no choice but to manually examine the relevant files in the local county court where the information is located.